This upgraded build of the J36S boosts the accel/decel profiles from 2/3 to 12/13 and includes elutriation particle separation. Above and beyond its BioSafety systems, the J-26S XPI Centrifuge brings high speed, low heat output, imbalance tolerance and low noise. This centrifuge has a more impact-resistant lid, full containment barrier and automatic rotor identification. Its ergonomic design--with lower instrument height and hands-free door operation--remains unchanged. 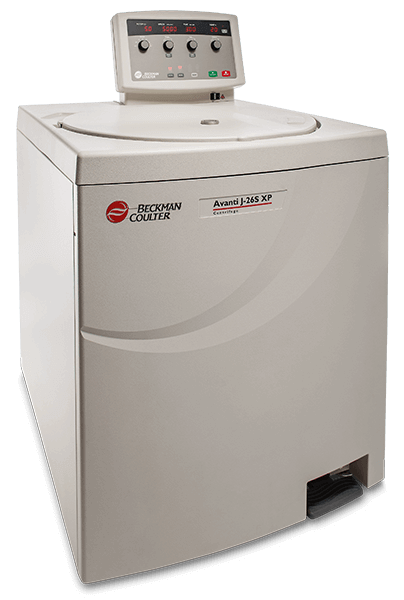 The J-265 XPI Centrifuge processes up to six liters of fermentor output in less than 10 minutes, delivers a subcellular fraction at 82,000 x g, runs 24 microplates at a time and separates live cell populations with elutriation. It automatically detects which rotor is installed and prevents the rotor from running above its maximum-rated speed, and enables quicker, quieter, more energy-efficient runs with better temperature control. The exclusive high-torque, switched reluctance (SR) drive shortens cycle times.